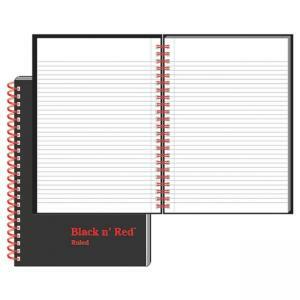 Media Size: A5 5.88" x 8.25"
Wirebound notebook has a hardback, laminated, wipe-clean cover to withstand extensive use. 24 lb. quality paper ensures that you can write on both sides. Each sheet is ruled and perforated for easy tear-out. Fashionable black cover is fastened with red twin wire. Twin-wire binding allows book to lie flat. Notebook contains 70 sheets.